WCI Parcel 20.04 | JTR Inc.
Parcel 20.04 was a three hundred (300) acre project located in southern Martin County. Jonathan T. Ricketts, Inc., and the environmental firm CZR working in close concert with the client, developed several site plans to accommodate the demands of the market. Once a one hundred (100) acre mitigation element was established, monitoring wells were installed in the existing wetlands to determine the existing wetlands hydroperiod during a one-year monitoring period. Using the data from the onsite wells and the South Florida Water Management District’s DBHYDRO, a construction plan was developed with microtopography to accommodate the various items of the planting palette. Permitting was required through the Army Corps of Engineers, the South Florida Water Management District and Martin County. Planting was completed in the winter of 2005 and the site is currently being monitored for ongoing success. 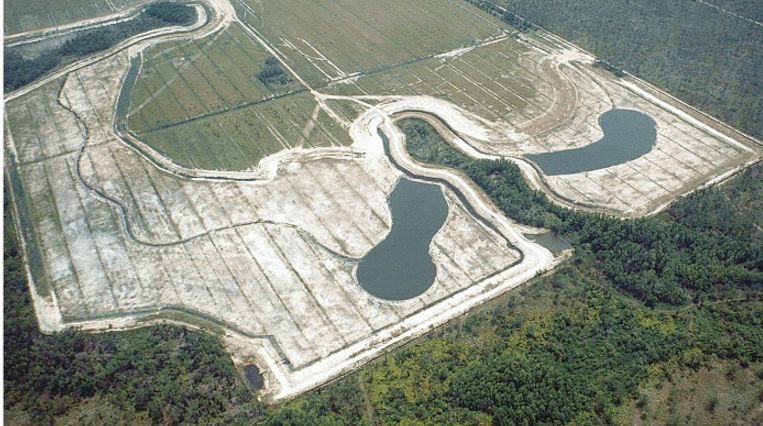 Keys to Success: Quick production of multiple site plans accompanied by construction cost estimates allowed for extensive review of multiple site designs; careful review of existing hydroperiods using onsite data, DBHYDRO data, and selection of site appropriate landscape palette, ensured a successful mitigation project.